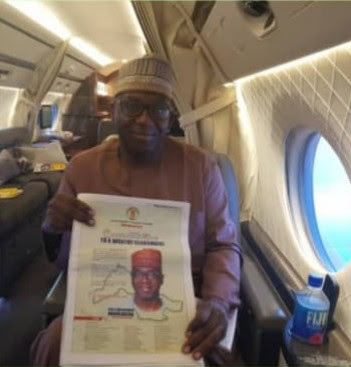 The Kwara State governor-elect, Alhaji AbdulRahman AbdulRazaq has bid the business community farewell as he prepares to take up the mantle of leadership. AbdulRazaq who has enjoyed huge success in business for over two decades was elected governor on 9th of March 2019 and will be taking a bow out of business to focus solely on governance. The Investors/CEO meeting at Rwanda will likely be his last business engagement before his official swearing in ceremony on the 29th of May. The governor-elect who is a successful business man has been tipped by many to turn the fortune of the state around with his wealth of experience in his personal business that has survived for years. The Kwara governor-elect, Alh. AbdulRahman AbdulRazaq who is in Rwanda to attend the Africa CEO Forum which is scheduled to hold from March 25 – 26, in Kigali will be saying farewell to colleagues and simultaneously seeking investors who can help boost businesses in Kwara state and create job opportunities across key sectors in the state. AbdulRazaq who is a successful businessman prior to joining politics made promises on provision of jobs and revitalization of the economy of Kwara State central in his campaign. With the abundance of both human and natural resources situated in the state, it won’t take much of time to reposition the state back to the right path. Now that he has secured the top job, he has swung into action in a bid to keep to his words and bring the much needed change to the state. AbdulRazaq believes having the private sector on board will ease the affairs of the state and open a window of opportunity for others to thrive has highlighted strategic sectors that can boost the fortune of the state upon assumption of office. The summit will have in attendance lots of successful business people across the continent with other business mogul across Europe, America and Asia continent.